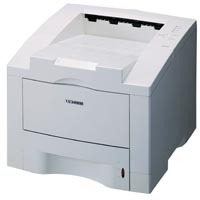 The Samsung ML-1651N is a network enabled SOHO 17ppm mono laser printer. With a resolution of 1200dpi and an average toner lifespan of about 8,000 pages (at 5%) it makes an attractive option for small to medium businesses to consider. The small footprint and fairly diverse feature set mean that companies currently looking for a quick, low cost printer can easily do so with out breaking the bank. With a total of 16MB on board memory and two 100pin SDRAM expansion slots, the ML1651N can be expanded to better suite specific printing requirements (large images or files for example), but from what we've seen during our use of it, 16MB is quite sufficient. A total of 144MB can be supported by the 166MHz RISC processor. A 500 sheet cassette tray on the base of the printer holds a good supply of paper for small office environments, and and external multi-purpose tray has slots and openings that will accept envelopes, transparencies, or heavy weight paper up to 28lb Bond. 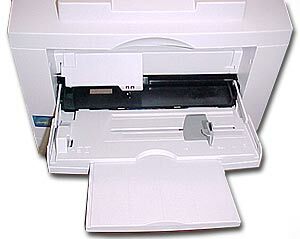 While the unit does have many of the features of larger office printers it is really not meant for rough handling, or strenuous environments. 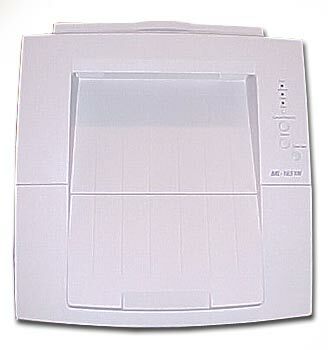 The fold-down tray on the front of the printer is of somewhat of a flimsy build. With plastic struts supporting the tray, one droped ream of paper could spell disaster. Manual duplexing is achieved by using this tray as well. This particular model of the ML1651N series comes with an Ethernet adapter card, USB and parallel port. The vanilla flavour ML1651 comes with just the USB and parallel ports, thought the network expansion card can be dropped in at a later date if desired. The printer comes with neither a parallel or a USB cable however.